The seminars for 2019 will retain the same high standards for which 'AWICS' is well known and will include some new and topical subjects. This seminar is an introduction and overview of this important subject. It is designed for people who are not experts in housing association finance, but who need to understand the basics and achieve an overview of what is going on. It is fully up to date with all developments. It refers to rents, service charges, development, sources of capital funding including grants and borrowing, housing benefit, welfare reform, business planning and much more. This seminar looks in depth at current developments in local authority housing finance in England – especially the implications of government policies, public finances, rent policy, welfare reform including universal credit, the reinvigorated ‘right to buy’, the homelessness reduction act, the flexible homelessness reduction grant, the affordable housing programme (including the new funding for social housing), the abolition of the borrowing cap, local housing companies (what they can offer, how to establish them and how to set one up) and new development. 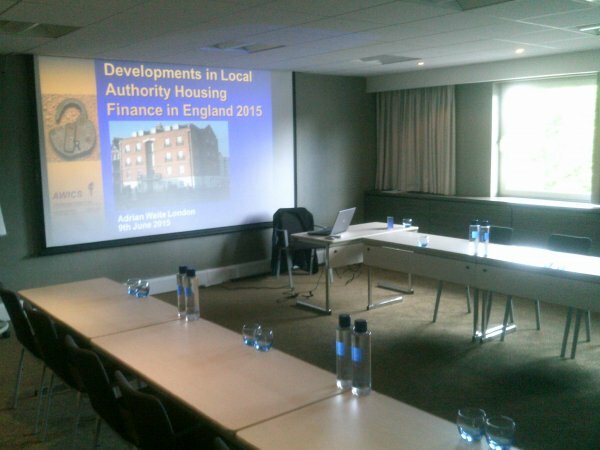 These seminars provide a solid grounding in the basics of housing association finance and are a useful introduction and overview of this important subject. They cover all aspects of Housing Association Finance including Income, Expenditure, Development, Capital Finance and technical financial issues. For more information, or to make a booking, please click here. This series of seminars gives an introduction and overview to this important subject and is fully up to date with all developments. It explains how the housing revenue account, housing general fund and housing capital programme works and considers the threats and opportunities facing local authority housing especially in view of the government's recent policy initiatives including the lifting of the 'borrowing cap'. We are holding seminars on ‘Universal Credit and the Management of Rent Arrears’ in September 2019. This seminar looks at how Universal Credit is being introduced, the effect that it is having on rent collection and arrears and at how rent arrears can best be managed as tenants move to Universal Credit. Rent arrears are an increasing problem in both local authorities and housing associations. The roll-out of universal credit is bringing further challenges and is driving increases in rent arrears. There is therefore a need to understand how universal credit works, including alternative payment arrangements, and how to manage rent arrears effectively. The seminar also looks at rent management strategy, value for money and how to move from ‘cure’ to ‘prevention’. Social housing is becoming increasingly important in Scotland at a time of rising demand for affordable housing. The Scottish Parliament has passed the Housing (Scotland) Act 2014, reformed the Scottish Housing Regulator, ended the ‘Right to Buy’ and is promoting and funding an ambitious development programme. The Scottish Housing Regulator’s new approach emphasises ‘Value for Money’. The United Kingdom government is ‘reforming’ welfare with significant implications for Scottish tenants and landlords, but some welfare powers have now been devolved to Scotland. Scottish local authorities therefore face significant challenges, not least the need to meet the Scottish Government's aspirations for development. This seminar is a useful introduction and overview of this important subject.